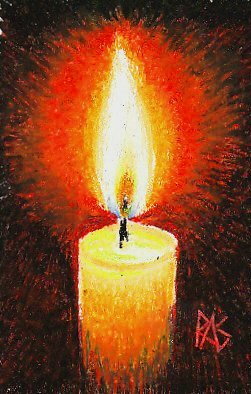 Maimeri Classico oil pastels from Italy are hard to find in the USA. They are distributed by ArmadilloArt and carried online by ArtSupplyWarehouse which is not the same company as ASW. Available in 48 colors, this brand is pigment rich and very firm, more hard than Cray-Pas Specialist. ArmadilloArt sent me a 12 color sample set which I used to create Imbolc, above. They went over each other more than blended. Maimeri Classico have a unique "dry" feel that I can only compare to Derwent Studio or Artist colored pencils -- in relation to other oil pastels, they seem to have this dry feeling, crumble a bit and blend less but have very strong pigment. The distributor also sent along PDF documentation with the list of all the colors rated for lightfastness, it also included pigments used -- in Italian. I was able to puzzle out what most of the pigments were and it's clear this brand is intended as an artist grade supply. I will be purchasing the full 48 color range next month and add it to my own independent lightfastness testing. Maimeri claims that all colors are lightfast, ** means Highest lightfastness and * means Medium lightfastness. On their other artist grade products, *** means Highest lightfastness, ** means Good and * means Acceptable lightfastness. My understanding is that they probably correlate to their other products and none of the Maimeri colors would be say, 8 on the Blue Wool scale. However, if all the colors rate 6 or 7 on that, the range would still be considered lightfast and reasonable for archival purposes or fine art. Thus I have listed Maimeri Classico as artist grade based on the company's documentation. It may bump down if it turns out only the ** colors rate as artist grade and the * ones fall below 6 on the Blue Wool scale, or if all of them come in below 6. The sticks are round, wrapped and reasonably large. Color names may be a little misleading, "Magenta" is mentioned as Napthol Red in other languages and so that may be an Italian's understanding of what Magenta is. In blending, the Magenta stick turned out to be a bright slightly warm red, the violet mixed with it was grayish as if some yellow was included both in the blue and the red. 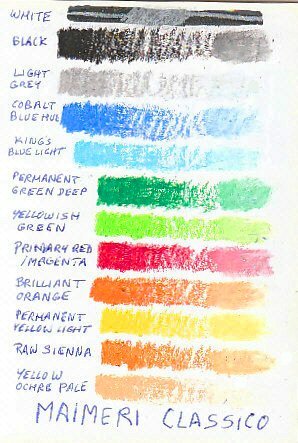 Here's a 12 color chart of Maimeri Classico oil pastels, the small set I tested with the above painting. I would recommend Maimeri Classico for use in sketching where you want a dry feel and less smearing, for earliest layers in a multibrand painting and for a modestly priced artist grade supply. Current price at time of writing is $39 for the 48 color set, very reasonable.